When is the real VW minivan coming? My Calla Lilly white VW Routan was gaining on the similarly white Chrysler Town & Country in the adjacent freeway lane. As we both hit the same bumpy overpass, the Chrysler van bounded up and down like a porpoise at Marine World. My Routan, on the other hand, dealt with the bump like a European sportscar: one quickly snubbed upward movement followed by one quickly snubbed downward movement. 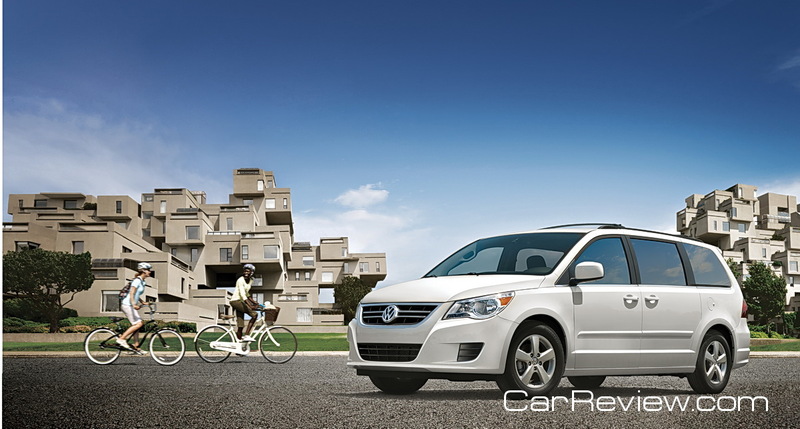 In a nutshell, that routine defines the Routan and distinguishes it from the domestic sibling upon which it is based, the Chrysler Town & Country. VW hesitates to use the “C” word in advertising the Routan. Nowhere in their advertising do they mention that their product is derived from the Chrysler Town & Country. While their reluctance is understandable, there’s really no reason to hide the relationship, because the T&C, which has owned the minivan market for decades now, is a solid and well appreciated product. Leave it to VW to make it even better. Let’s start with outward appearance, where VW has improved front and rear clips by dechroming and debadging the Chrysler product. The addition of clean looking, 5-spoke, 17 inch Soho alloys on the SE model gives the Routan a Porsche-like presence. Inside, the Euro-makeover is even more striking, with lots of brushed aluminum trim gracing the dash and door panels. A stubby rally-style shift appendage projects from the dash handily at shoulder height. The seats excel with great cushion comfort and much appreciated side bolstering. A small center tunnel console allows passenger movement between front and rear seat areas. Rear seat occupants are well catered, with separate DVD screens for second row and third row dwellers. VW calls their system the “JoyBox,” and it includes touch screen controls, a 30GB hard drive and wireless headphones. The remote control for the JoyBox stows neatly in an overhead compartment that also stores the second row fold-flat screen.